Like in the “Thirty-six views of Mount Fuji” by the Ukiyo-e most famous artist Hokusai, this natural symbol is a beloved subject for many japanese artists, as well as foreigner ones (myself included): in every season this mighty volcano shows a different face and, whether the summit is snowy or not, its unmistakable shape makes the landscape unique. There are almost endless photographic possibilities because Mount Fuji is visible from far away, like from Tokyo that’s about 100km north-east, but the thing that offers the most beautiful sights of it is the “Fuji Goko area”, that is the “region of the five lakes”. All around the northern slope of the mountain, the lakes Yamanakako, Kawaguchiko, Saiko, Shojiko and Motosuko form a sort or ring from which the view is absolutely enchanting. The vantage points are so abundant that some japanese photographers decided to focus their activity on shooting Mount Fuji from every location and in every moment of the year. My case is obviously the opposite, I had to capture the best views I could in less than a single day, making this experience quite challenging. Having to cover about 400Km by car from Osaka, the alarm rung at three o’clock in the night, making the departure a situation I don’t remember clearly… Surely I didn’t find myself in the traffic jam. 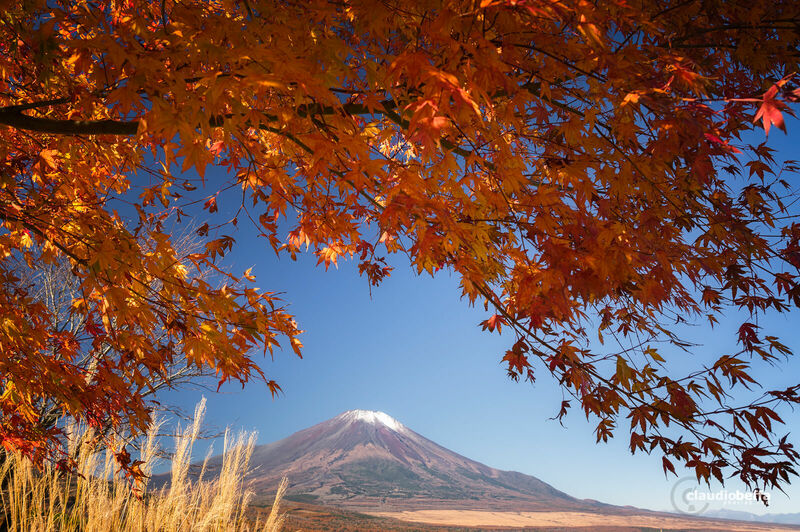 What I perfectly recall is the magnificence of the view of a snow-capped Mount Fuji immersed in an autumnal landscape: the uplands and the valleys, tinted by every shade of color from bright yellow to vibrant red, made the imposing mountain stand out against a clear blue sky. I took my first shot of the day from a distance, to be precise from an hairpin turn of a road that leads to the valley at the foot of the mountain: I found a momiji colored with a beautiful tone of orange with a bush of golden susuki (pampas grass) at its base; taking advantage of the particular shape of the tree, I’ve composed a frame in which Mount Fuji is wreathed with the elements of japanese autumn. The following stops were the two lakes Kawaguchiko and Yamanakako: I’ve spent the first half of the day along the lakefront of Kawaguchiko, enjoying the beautiful views offered by its north-eastern shore. The good visibility of that sunny clear day allowed me to capture a detailed view of the snowy summit of Mount Fuji; it was even possible to see the zigzag climbing path, on the gentle slope of the volcano (and that’s the only way I’ll see that path with my eyes, because I don’t think I’ll try to take on the ascent of Mount Fuji…). After a brief lunch I’ve headed to the second scheduled lake, the Yamanakako; the northern shore of this lake is less rich of viewpoints than Kawaguchiko because it’s basically a road than runs along it, nonetheless it offers some wider views and more water to include in the frame. There I’ve found a beautiful and incredibly red Momiji tree, with a foliage so dense that made me think of it as a red cloud; I’ve tried various compositions to include this momiji in the frame together with Mount Fuji and the one that works better to me is the portrait view, in which I’ve excluded on purpose the tree’s trunk to show its foliage just as a cloud, above the volcano. As the sunset was approaching, I moved toward the southern side of Yamanakako where, in a small grove of momiji trees, a light-up event was in program. There I’ve enjoyed a magical moment of that day: the sun disappeared right beyond Mount Fuji and the twilight tinted the sky of a beautiful orange and pale indigo shade. 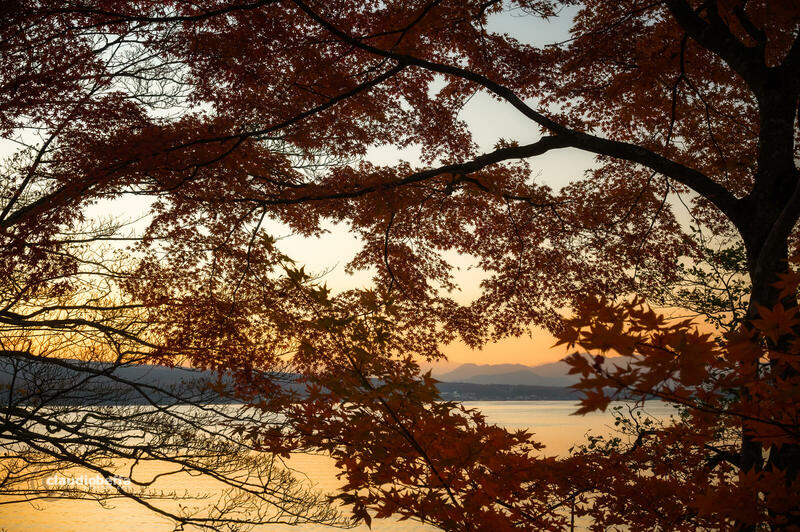 The silhouettes of momiji leaves, whose vibrant orange was still barely visible, were forming a sort of natural curtain through which small glimpses of the lake and of distant mountains beyond it composed a landscape of tranquility. A view of lake Yamanaka during twilight time, seen through Momiji branches. The dusk was already over and the night was coming in, bringing with it the cold and humid air of November. 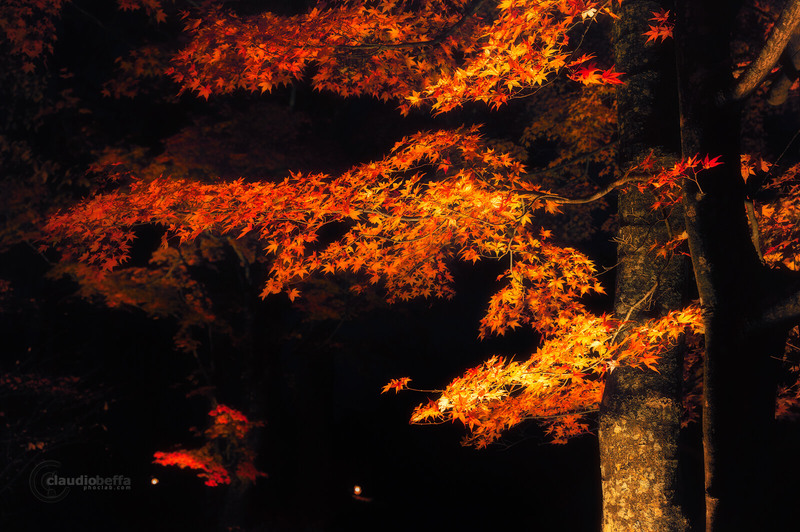 The grove of Momiji trees, with its small path, were illuminated by many spotlights which created a magical atmosphere: strolling along the path and enjoying the beauty of so many billows of vividly colored leaves popping out from the darkness has been an amazing experience. I hope that the shot I’m presenting here can depict at least a fraction of the magic of that scene. 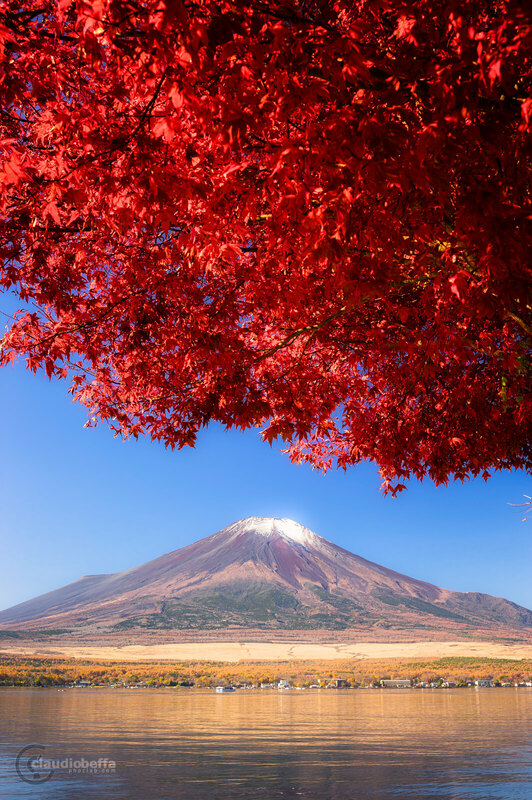 This second article about the Autumn in Japan ends here and I wish that the reading and, especially, the photos can spark in you the longing to visit the area of Mount Fuji to experience an amazing trip and to discover the many wonders of this place. 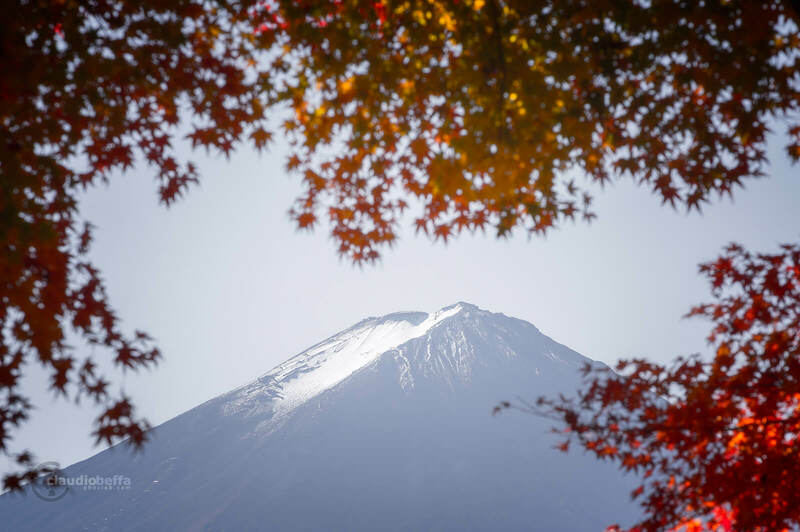 As a reference to organize a trip in the Fuji Goko Area, the best time to go is mid November, but it depends on the climate of the specific year. I suggest you to have a look at the map of autumn colors of Japan , by japan-guide.com and also keep an eye on the Autumn color report 2016 to follow the progress of red foliage throughout the entire country in almost real time.